Approval for agile projects becoming more agile? Unless you work in a particular corner of Government digital/IT then this won’t be very exciting but if, like me, you are toiling away in that specific corner then Friday was a ‘red-letter day’! The new guidance from Treasury (with a major dollop of GDS influence) about the process & procedures for getting approval and funding for ‘major projects’ in the digital world is a major, major improvement and has the potential to be as influential as any changes that have been made since the ‘Revolution Not Evolution‘ report was published and started us all down this latest digital government path. 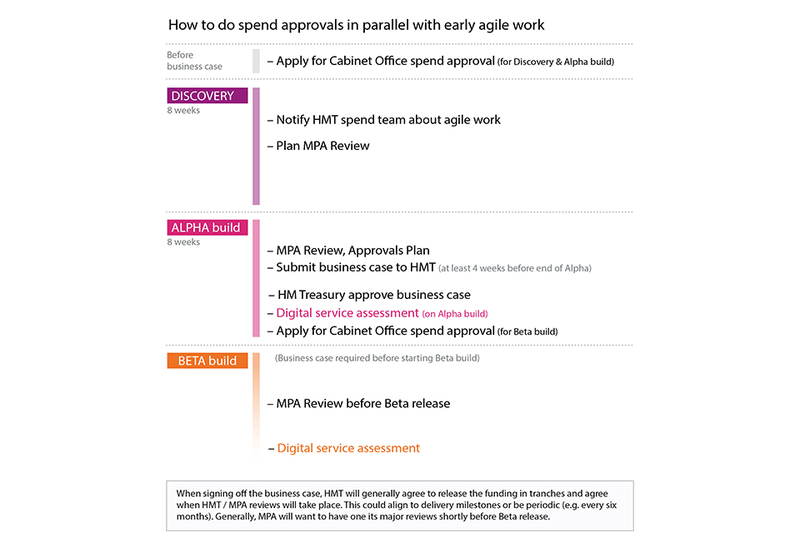 The new guidance empowers organisations to follow the Service Manual and get on with the Discovery and Alpha stages (with a pretty generous spending ceiling for this activity) without having to produce a business case for Treasury approval and then agreement to move to Beta and beyond will be dependent on a lightweight case backed up with a working Alpha. I have only been involved around the edges of producing our business case but the process has clearly been at odds with the other best practice that has been coming out of the Cabinet Office/GDS and this is a great step forward. It also completely endorses the approach we are taking with the work we are starting at the moment and that is always reassuring. ..it is good practice for government organisations to also follow the same principles internally when dealing with smaller spend. The other big blockers I see in delivering on the promise of the approach the Service Manual demonstrates continues to be, the related issues, procurement and recruitment. A lot of work is going on in both areas but both are still difficult to navigate. Fingers crossed though because if this can be done I am starting to believe in miracles! Previous Post Bristol: A City of Service?